Infectious diseases are an important cause of malnutrition. Recurrent infections increase the risk of malnutrition while poor nutritional status results in lowered immune status and predisposes to infectious disease thus propagating the vicious cycle of infection and malnutrition. The nutrition-infection-immunity axis is crucial for both developed and developing countries and is now a central feature of many nutrition and infectious disease courses. Bringing together nutrition and immunology, Nutrition, Immunity and Infections covers the topic in an accessible format for all students of nutrition, medicine and public health. 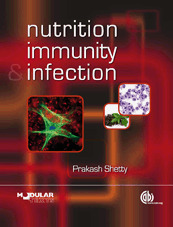 Through his work at the London School of Hygiene and Tropical Medicine, the FAOs Food and Nutrition Division and his current post at the University of Southampton, Professor Shetty has built a reputation to match his wealth of experience in the relationship between nutrition and susceptibility to infection.